Stability in goal doesn’t necessarily correlate with success, but the converse is almost always true. The Flyers are one point out of the NHL’s basement, and on Tuesday, in just their 43rd game of the season, they used their seventh different goalie—no team in the history of the league has ever used more. 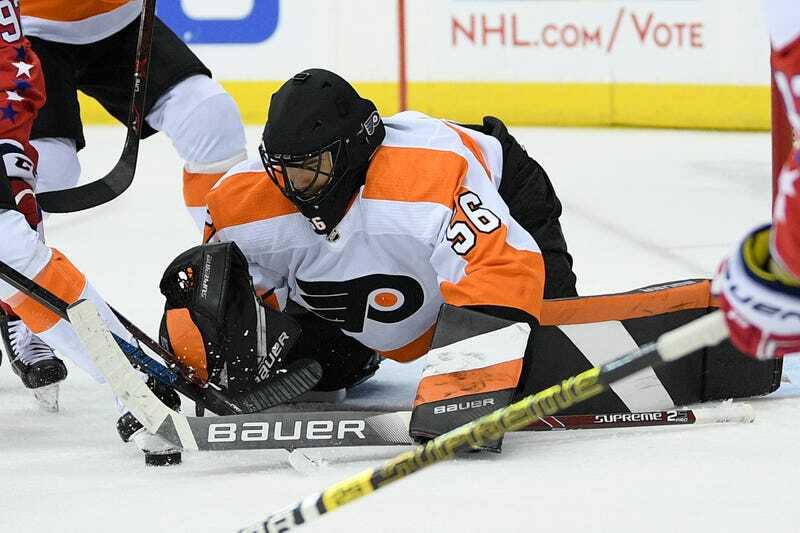 Mike McKenna, a 35-year-old American journeyman on his third team in a week, got the nod in net for the Flyers and stopped 21 of 25 shots as Philadelphia fell 5-3 to the Capitals for their eighth loss in a row. With McKenna’s appearance, the Flyers have now tied the 1989–90 Nordiques, the 2002–03 Blues, and the 2007–08 Kings for the most goaltenders to see action in a season. No team has ever used eight, but given how the Flyers’ luck has gone this year, McKenna should probably watch out for stray lightning bolts. Already this year, Philly has played Brian Elliott (13 starts; injured), Calvin Pickard (eight starts; waived, now with Arizona), Anthony Stolarz (seven starts; injured), Carter Hart (seven starts; healthy, got a night off! ), Michal Neuvirth (six starts; injured) and Alex Lyon (one start; back in the AHL). That list doesn’t include 22-year-old Rylan Toth, a college player who serves as a Vancoucer-area emergency goalie, who suited up and sat on the bench when the Flyers were down to one healthy netminder, but didn’t end up getting into the game. Enter McKenna, who’s been around. Since making his NHL debut in 2009, he’s appeared for the Lightning, Devils, Blue Jackets, Coyotes, Stars, and Senators. Last week, Vancouver traded for him, but just two days later, placed him on waivers. The desperate Flyers claimed him, and it was off to Philadelphia. Carter Hart is the No. 1 and the future here, so it’s back to the bench—or worse—for McKenna. But if he doesn’t hang on with the Flyers any longer than he did with the Canucks, he’ll still be all right: tape comes in lots of colors these days.